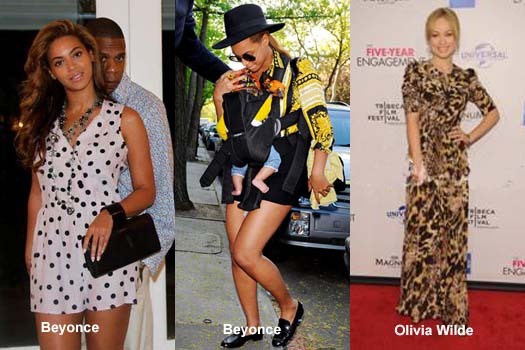 DALLAS, Apr 19, 2012/ — Motherhood has also enhanced Beyoncé’ fashionista status. On Tuesday, April 17th, the new mother was spotted in Brooklyn wearing a Versace shirt. Beyoncé, who was accompanied by her daughter Blue Ivy, wore a long sleeve printed silk Versace top. The shirt is available now in Versace boutiques nationwide. On her namesake tumblr account, Beyoncé was spotted with husband Jay-Z carrying a Perrin Paris 1893 menotte black leather and patent bracelet clutch. Olivia Wilde, recently of the hit TV series, “House” and lead female star in “Cowboys & Aliens” attended the New York premiere of “The Five Year Engagement” at the Tribeca Film Festival in New York City, NY on April 18, 2012 wearing a leopard print silk crepe gown from Yigal Azrouël Pre-Fall 2012 collection.